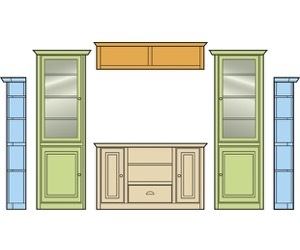 We are available to assist you with the design of your wall unit, storage system, kitchen or bathroom and make sure you choose the right products, styles, and options. We have a great selection of bookcases with optional doors, drawers and other features, and you can even customize dimensions and order online! Choose from our great selection of components to create your own custom media center with space for a TV, audio components, DVDs, and CDs. 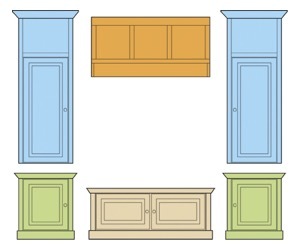 We've got ready-to-ship stock cabinets, semi-custom unfinished or finished cabinets, and super-customizable cabinets with tons of design options. Create a home office with components such as desks, keyboard slides, file cabinets, CPU cabinets, hutches, bridges, roll-out shelves, and more. 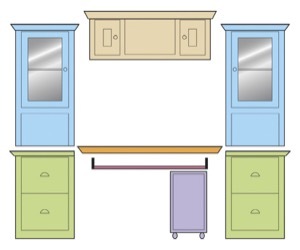 Create an organized hub with bench seating, coat racks, lockers, and cubbies for storing anything and everything. 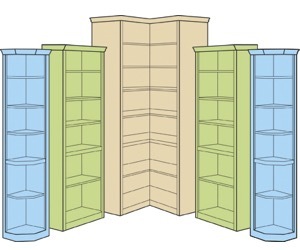 Build a wall unit to store all your precious books and collectibles! Design a media center with a large-screen TV and plenty of storage for DVDs, CDs, pictures and collectibles. 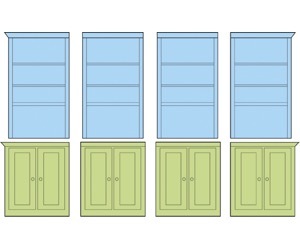 Design a mudroom locker unit for storage of coats, books, and all your outdoor gear. Design your own custom media center. 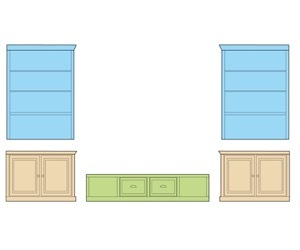 Design a window wall with a bench seat and bookcases on the sides. Design your own home office desk system. Turn the corner of your room into a centerpiece for books and collectibles. Create a mudroom where you can change into and out of your boots and coats. Maple in Creme paint with Chocolate highlighting. Island in Cherry wood and Espresso stain. 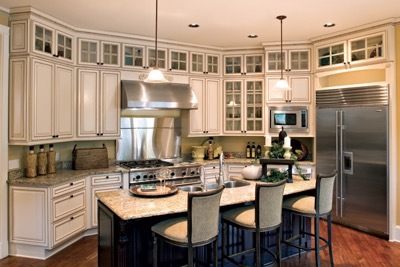 This bright, open kitchen features plenty of mullion glass doors to display your favorite collectibles and lots of working counter space. Cherry in a Hazelnut stain finish. 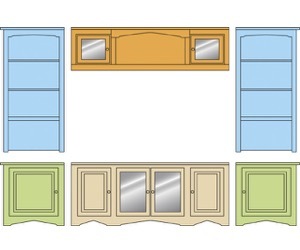 Arched valances mirror the arched Roman profile of the upper cabinets over the cook top, island ends and glass doors, and fluted columns on all four corners of the island give it a furniture look. Alder in Cinnamon stain with Licorice glaze. Island in Maple wood and Burnished Ebony stain. 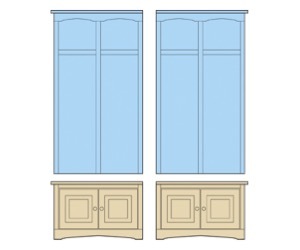 A quick way to dress up a design is to add arched valences to open cabinets, and top with decorative mouldings. 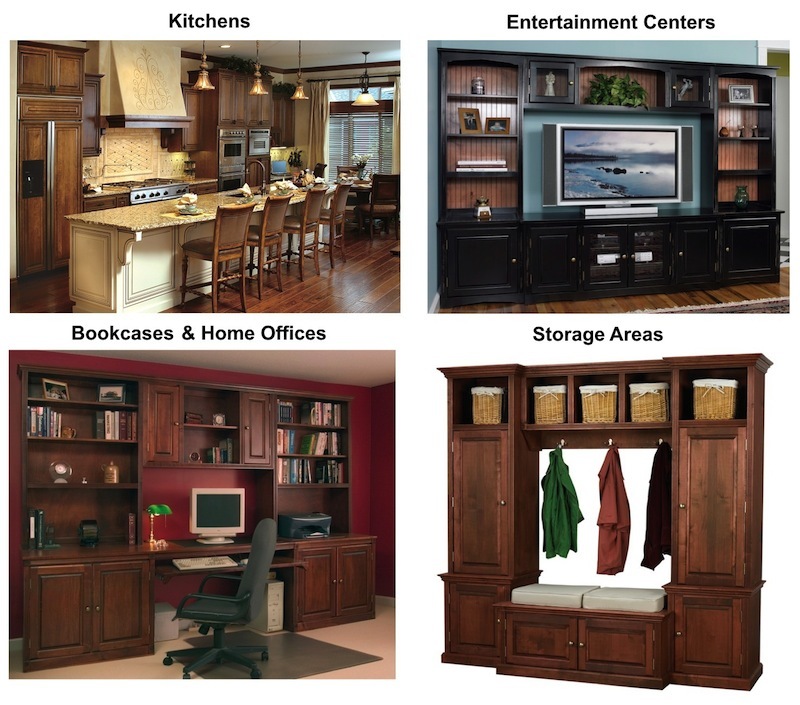 Highlands Designs was established in 2006 to provide customers with a quick and easy way of buying customizable bookcases, cabinets and furniture online. We have served over 4,000 customers with orders both large and small who wanted to take charge of their own home remodeling project. 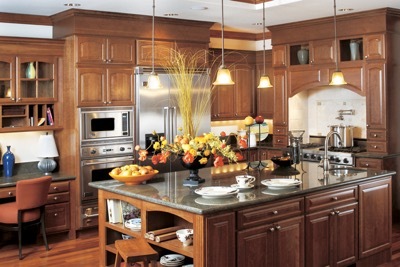 We know how tedious it is to go to a large design center or home improvement store such as Home Depot or Lowes, sit down with a designer for several hours, and end up paying more than necessary or not being able to get the sizes or styles you want. So, we created a site where you can shop for everything online without the hassle. We aim to provide the best customer service possible to help you with your design and product selection. If you already know what you want, you can specify custom dimensions, select options, and order online in the comfort of your home. No need to spend hours at a big box store trying to get a quote! Literally the only place on the planet that will build an order online, instantly quote the price, and offer a quality product an a reasonable cost! 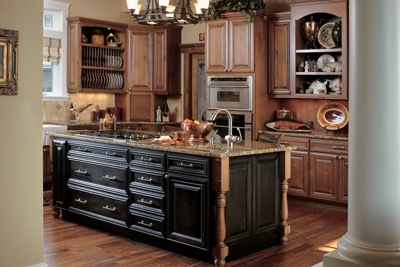 We had a great experience using Highlands Designs to purchase all new kitchen cabinets. Send an email for the fastest customer support.